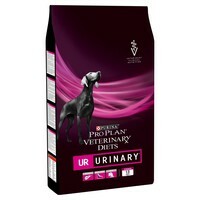 Purina Pro Plan Veterinary Diets UR Urinary Dry Dog Food is a complete veterinary diet to help dog’s with struvite urinary stones. Containing moderate protein levels to minimise the availability of food for bacteria, Purina UR has been formulated to produce urine that is acidic, which helps to both dissolve and minimise recurrence of struvite stones. Additional Omega 3 and antioxidants help to support the health of the urinary tract. Please Note: Not suitable for dogs that are receiving urinary acidifiers. If in doubt, please consult your veterinary surgeon.